Mama Madikizela-Mandela, the most prominent woman in the fight against apartheid, died last Monday. The struggle stalwart and former wife to South Africa’s founding President Nelson Mandela was famed for her courage in the face of a brutal racist regime. In a statement yesterday after arriving from China, President Mnangagwa said: “As we mourn her passing on, our best tribute to her work is to apply ourselves true and harder and in unison, for the realisation of her vision for genuinely free, democratic, non-racial and egalitarian Southern African which becomes a just home to all, regardless of race, colour, class, creed or gender. President Mnangagwa said Mama Madikizela-Mandela’s death was hard to accept. “The death this week of Mama Winnie Madikizela-Mandela has been keenly felt by most in our whole Southern African can region and even more so by all of us drawn from the ranks of freedom fighters and liberation movements who regarded her as a fighter for freedom and a fearless comrade-in-arms. Tributes have been pouring in for Mama Madikizela-Mandela. Vice-President Dr Constantino Chiwenga said in Mama Madikizela-Mandela, Zimbabwe had a friend and comrade-in-arms. In an interview with The Sunday Mail yesterday, Chairperson of the Parliametary Portfolio Committee on Women and Youth Affairs Mrs Pricilla Misihairambwi-Mushonga said women’s organisations were organising a memorable service in Harare to honour the struggle icon. 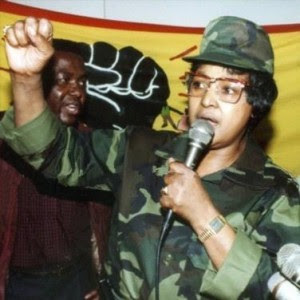 “We have agreed as the Women’s Coalition in Zimbabwe to hold a memorial service in Harare to honour Cde Winnie Mandela. We have been in touch with South African Ambassador to Zimbabwe (Ambassador Mphakama Mbete) and we are currently organising the memorial service. Born in Bizana in the Transkei in 1936, Mama Madikizela-Mandela met Mr Mandela in 1957 and they married the following year, supporting her husband in the fight against apartheid. While Mr Mandela was jailed (1964 to 1990), she played an instrumental role in the fight against apartheid from her home town of Soweto. Mama Madikizela-Mandela became an international symbol of resistance as she inspired liberation movements in Southern Africa and beyond. Last week, South Africa’s government said Mama Madikizela-Mandela – who President Cyril Ramaphosa has described as the “mother of the nation” – would get a special official funeral on April 14 in Johannesburg, with several international dignitaries expected to be among the mournders.